Cook the asparagus in shallow, simmering salted water for 5 minutes. Drain, arrange on a platter and drizzle with EVOO. While the asparagus cooks, make a pile of garlic, lemon zest, parsley and anchovies. Finely chop all of the ingredients together to form a gremolata paste. Sprinkle the gremolata paste liberally over the hot asparagus. Serve hot or at room temperature. In Recipes-list.com we have selected the most viewed recipes from category - uncategorized . Enjoy the best recipes specially selected for you! 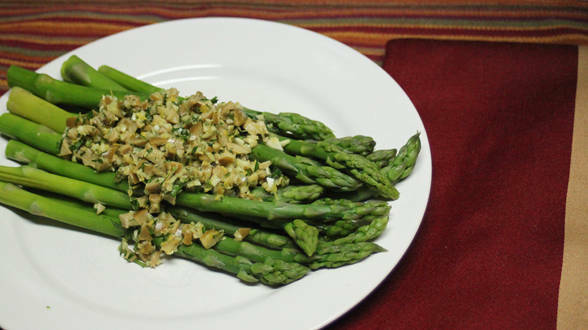 Asparagus with Gremolata is the right choice that will satisfy all your claims.